Driving home today I happened to hear some stock market guru on the radio (there are countless numbers nowadays, and I didn't get his name during my brief time in the car) predicting that the "bull market" will steadily march onwards and upwards and he compared it to 1982 (when the S&P 500 Index was around 140 vs. today's 1,500 plus), pointing out that bull market move began when unemployment rate was more than 9% vs. a little under 8% today. I didn't quite get the connection to the S&P other than the inference that things looked gloomy then on Main Street as they do today. He sounded like a youngish man, probably either unborn in 1982 or in diapers. He's right about the gloomy part, but he failed to cite other relevant data points in the comparison, such as the Price Earnings Ratio (P/E) that was about 7.5 then vs. today's 17.5. Also, adjusting the 1982 140 S&P for the CPI, it was really about 340 not 140. So, half the growth of the S&P since then is explained by the expansion of the P/E multiple. Classic asset allocation models dictate that if the earnings yield is less than the yield on a 10 year Treasury Note, stocks are overvalued and conversely, if the earnings yield is more than the 10 year T Note, they are undervalued. By that measure, stock markets should indeed continue to rise now, but they should have been flatlining in 1982. The reason the usual asset allocation rules may not apply to either scenario is that both 1982 and 2012 represent extraordinary economic times, almost the mirror images of one another, but with one thing in common: the Federal Reserve is in the pilot's seat. 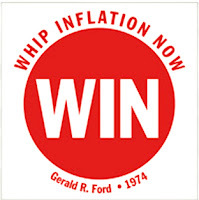 Remember during the Ford administration we were brandishing "WIN" (Whip Inflation Now) buttons? The oil embargo of 1973 had ratcheted up crude prices from 1972's $3.60 to more than $30.00 by 1982. 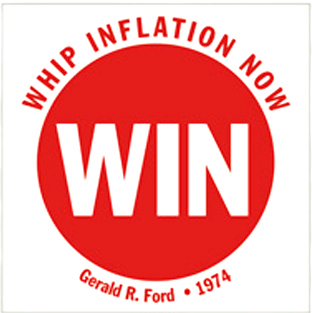 Consumer prices followed and wage demands took off. Paul Volker's Federal Reserve slammed the breaks on the economy raising interest rates to unheard of levels. Today, we have the flip side of the coin. The economy nearly collapsed five years ago into a depression and the Fed became the purchaser of last resort of mortgage-backed securities and is still buying 90% of new US Treasury securities, creating a scarcity of Treasury debt and ratcheting down rates to unheard of levels, this time to "Whip Deflation Now."